Ich habe in den vergangenen Jahren mit herausragenden Menschen zusammengearbeitet. Ganz gleich ob bei CompuNet, GE Capital, in einem meiner bislang fünf Eigengründungen, ob bei Tamedia oder Doodle, oder bei einem der vielen externen Dienstleister und Partner. Mit großer Freude habe ich während meiner Zeit als Doodle CEO ein Herzensprojekt umsetzen können. In der englischen Sprache wird das Thema mit ‘efficient time management’ beschrieben. Auf Deutsch ist das am besten mit Arbeitsproduktivität übersetzt. Ich konnte mit 30 großartigen Kollegen über deren Erkenntnisse zur Arbeitsproduktivität sprechen und deren Erfahrungen in einem Buch zusammenfassen. Die Veröffentlichungen sind in Englisch erschienen, hier ist der Link zum kostenlosen Download auf Amazon . While working as the CEO for Doodle in the past years, I came across many hundreds of professionals working in different fields of knowledge all aiming to lead a productive lifestyle and most of them trying to work on their personal time management. It’s because of our commitment to making Doodle a truly time-saving platform that it has been embraced itself as application by productivity and time management experts everywhere. These are the people who inspire innovative products, like Doodle, and push us to continue finding new and inventive ways to improve our service. And clearly, the talks with these time management experts brought up the starting idea for a book, the Doodle productivity book. We wanted to understand productivity from the point of view of the experts — how they start their day, approach challenges and achieve a consistently high output. Naturally, we also wanted to explore the technologies and tools used by the go-to guys for major global businesses and organizations. In short: We asked 30 experts from around the world to clear some space in their schedules, and share their best kept secrets. 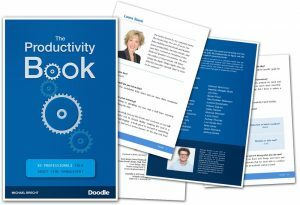 Compiled over the years, this book shares the invaluable advice of the world’s top productivity experts. Enjoy reading these insights and more importantly: use the best ideas for yourself – this is what this Book is all about. 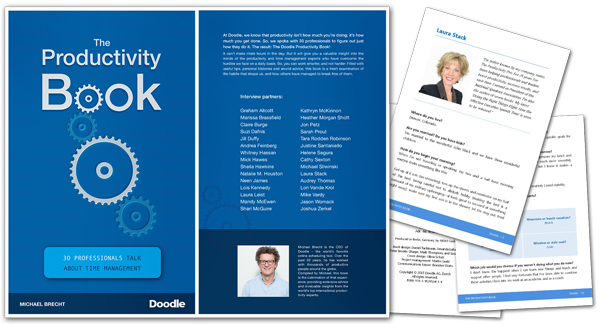 Download the Doodle Productivity Book here on Amazon or itunes and provide us with your feedback.